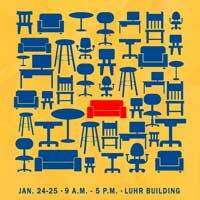 All members of the University community are invited to attend the upcoming ISB Furniture Fair, to be held from 9 a.m. to 5 p.m. Jan. 24 and Jan. 25 in the Luhr Building. This is the chance for all students, faculty and staff to offer feedback on the furniture that is under consideration for the ISB. Snacks will be offered and prizes will be drawn for attendance. See http://news.webster.edu/webster-life/2016/furniture-fair-isb.html for more information. The final review of the mockup structure is happening this week. That review is expected to finish Jan. 10. The mockup can be found near the southwest corner of Lot K.
Glass is being installed in the curtain wall on the exterior of the building. That work will last through the end of the month. Retaining walls and window wells will be installed on the exterior of the building starting Jan. 20 and lasting through Feb. 7. Ductwork and piping continues to be installed on all levels. That work will last through the end of the month. While preparing for the next phase of columns, floors and walls being erected, work crews found that the existing garage is out of alignment in its northeast corner, which could create an issue in aligning the new structure with the current structure. Crews are currently developing a correction to this issue and hope to be back on track with the project by next week. Because work has been slowed due to the alignment issue, several parking spaces in the existing garage that have been temporarily blocked for safety reasons will continue to be inaccessible for another two weeks. Plumbers continue the underslab work. The recent inclement weather delayed a concrete pour of the back of the slab. That pour will happen in the next few days. The electricians continue to run new conduit to feed the lights in the new garage.